No, Kati and I are not pregnant (although feel free to pray for that to happen). This “drop” in numbers appears to have been happening over the past few months. This pattern caused the pastor to preach what he preached yesterday. I have to say, I laughed out loud (involuntarily at some points) more than once during this message. But what cracked me up most was the new board. 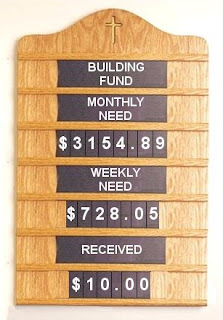 The following is my impression of the “Building Fund” board. how $728.05 weekly gets to $3154.89 monthly. Yes, that is right, we have 10.00$ in our building fund. And we need 3154.89$! I am sorry, but that just cracks me up – 10.00$!!!!!. Oh and that’s not all! Our “general fund” is about 1000.00$ in the hole! So we heard a word from God. Specifically from Haggai 1. This is when God warned the Israelites because they spent 16 or so years building their own homes and wasting their money, instead of building God’s temple like they originally intended to do. This was used as an example of what was happening among us. There were references to “sin” being in the “camp” which was causing the numbers to drop (both head count and money count – which is fairly obvious). Regardless of that fact that I got a good laugh about what was said, I was also very upset. I was saddened and angered over what was spoken. I was not convicted nor do I think I am being prideful. I was most of all upset because I knew there were people there who were hurt and were made to feel guilty instead of being discipled or edified. You see, no matter how many times the speaker said that this was not a message to knock people around but a message to warn them – it seemed like a message to knock them around and guilt them into a paradigm of building buildings and showing up to weekly lectures. At one point he said “If you have ever said, ‘I’d like to come to Bible Study on Wednesday nights but I have to work – God will understand,’ then you know where the Israelites were at here in Haggai.” He gave numerous other examples like, “I’d like to tithe, but we cannot afford it this month” and other nonsensical drab. At the end of this message, there was an “invitation” to “obey God” in tithing. Many people went up to the stage and did whatever it is they did. The preacher concluded saying that he knew many hearts had been changed. My question is this, where they changed because of what the Bible teaches, because of a conviction from God? Or where they changed because they were made to feel guilty by someone whom they trust to teach them the truth? I’m glad that we do not have to be concerned with building the temple. God has already built the temple – and we are the temple. Now, all that is required of us is to live in God’s grace and allow him to arrange the temple as he sees fit. But, you know, there was once another young man, named Stephen, who taught that God does not live in buildings. The religious leaders stoned him. I’m sure your leaders will not stone you, but I do hope they will listen to you. I’m going to guess that their “hearts” were “changed” because of guilt … and that it lasted about 5 minutes after they left for the day. It’s so sad isn’t it? p.s.s. Praying for God to bless you and your wife with the precious gift of children!! I figured some might take it that way – which is why I clarified ;). We definitely are the temple of God – Amen! Jesus said that his burden is not heavy, but we sure try to make it heavy. I too hope that I do not get “stoned” too, but if I do, I will count it as stripes for Christ. Paul was stoned numerous times and he only used it to testify to the power of God! I think you are right… this kind of change is not an everlasting change because it does not come from an everlasting source. If I am given the opportunity to speak my mind about this issue, then I will. Luckily for me, I am currently teaching a Sunday School class for the next couple months. I’m not going to tell people what to believe, but I am going to try to show them how to look for what to believe (i.e. open your bibles). I do not think it makes you old to enjoy Pink Floyd. I have no idea how old you and Brandon are, but I am only 27 – I’m not old! I barely even feel like I am 26 1/2! Thanks for the comments, Alan and Heather. lew – did you confront this crap at all? you know from one my posts that i likely would have stood up during that crap and walked out. no one needs to be exposed to that abusive vain employment of the Lord’s name! I will keep you all updated as things happen. I did not walk out, I did not feel that would be the best way to approach the situation. I plan and hope to take alternate avenues to confront what had happened. At one time I was heading to a position that would allow me in “full confidence” to preach what was preached on Sunday. I thank God that he showed his grace and mercy on me and steered me closer to him.